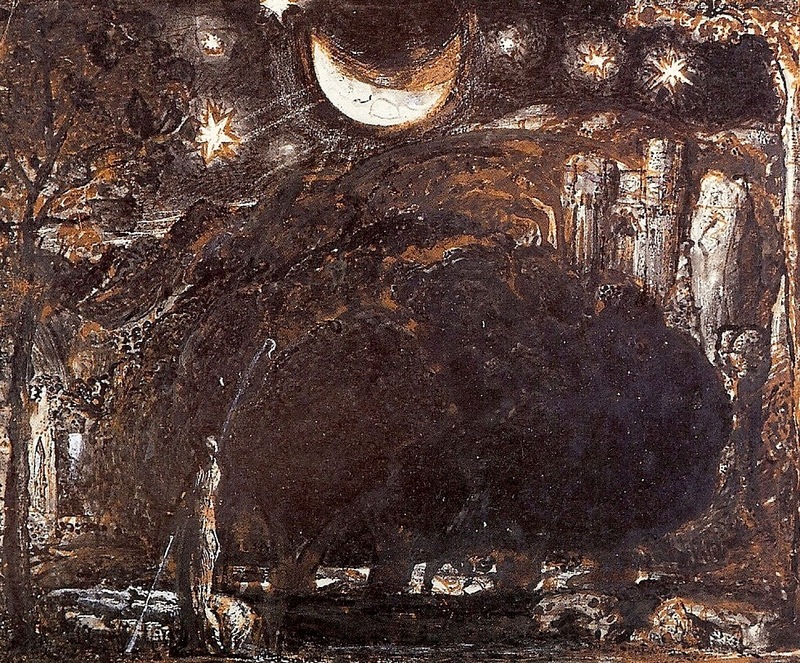 A contemporary of both Blake and Turner, Samuel Palmer (1805-1881) was one of the great English visionary Romantic painters, landscape painter, print maker and writer. The son of a Baptist minister, Palmer, like Blake and Turner was also a Londoner who was first exhibited at the Royal Academy at the age of fourteen despite him having no formal training. His work is deeply moving and hauntingly melancholy with nocturnal landscapes of rural Kent outstanding for their haunting and dream-like qualities. 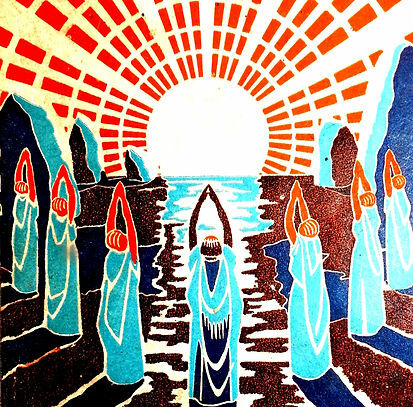 "In 1824, he met William Blake whose influence helped confirm his visionary approach to art. Palmer retreated into rural isolation in the village of Shoreham, Kent, his own 'Valley of Vision'. Here he produced his most distinctive work, and gathered around him a group of artists (including Edward Calvert and George Richmond) known as 'the Ancients'. He married in 1837, and on his two-year honeymoon in Italy, his style turned to intensely coloured watercolours, with an obvious spiritual connection to his subjects. The striking watercolour "A Cornfield by Moonlight with the Evening Star" is one of his finest works from the Shoreham period and was acquired by the British Museum in 1985 after a public appeal. Samuel Palmer was active during the great flowering of British landscape painting in the first half of the nineteenth century. His work influenced many artists of the twentieth century, including Graham Sutherland and Eric Ravilious." "When the artist Samuel Palmer died at the age of 76 in 1881 he was just beginning to rally from decades in the doldrums. 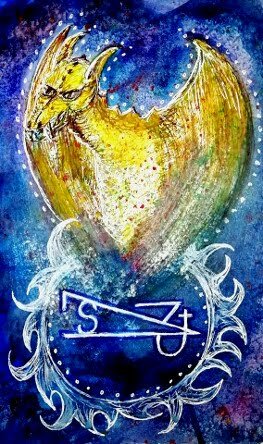 A humbuggy London solicitor had recently paid him to produce illustrations to two of Milton's minor works, and the commission, while hardly starry, had unleashed the kind of creativity that looked back to Palmer's glory days 50 years earlier. In images such as The Lonely Tower, done to accompany a line from "Il Penseroso", Palmer turns a rural Surrey scene into an unsettling arcadia, complete with a phantasmagorical night sky." 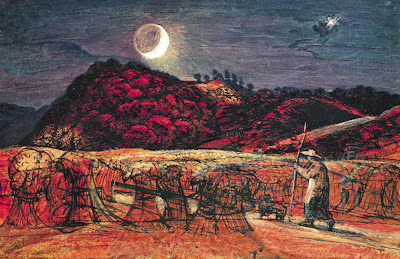 Thank you for showcasing Samuel Palmer and thank you for your cogent and impassioned survey of his work. 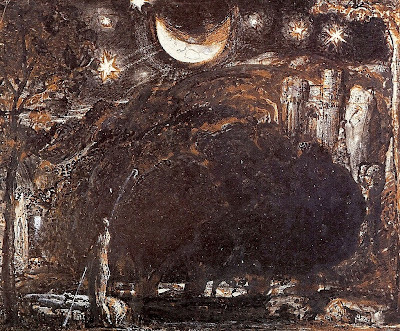 I am also a painter but I didn't recall Palmer, even though I'm an admirer of Blake & Turner. I'm not as up on the British painters. Burchfield expose was great, I've loved his work since I first saw it. Do you know the work of Albert Pinkham Ryder or Ralph Blacklock? ( Both late 18th early 19th century american painters.) Another great american landscape painter IMO was George Inness. We seem to have the same sensibilities with regards to painting. Your comment about looking at the real thing as opposed to reproductions is spot on! All great work suffers in reproduction while poor work looks better, same for live music vs a recording. 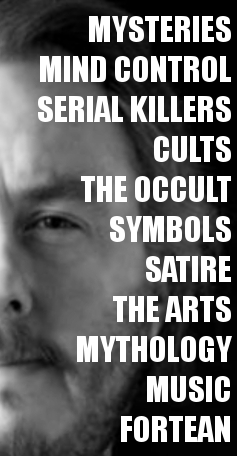 I look forward to your lectures on more painters, poets and writers, sculptors etc. Thank you for speaking. Sorry I misspelled the name, it is not the cheesy english hack blacklock, my apologies to everyone. Never heard of Burchfield before. His art is a revelation. Thanks. 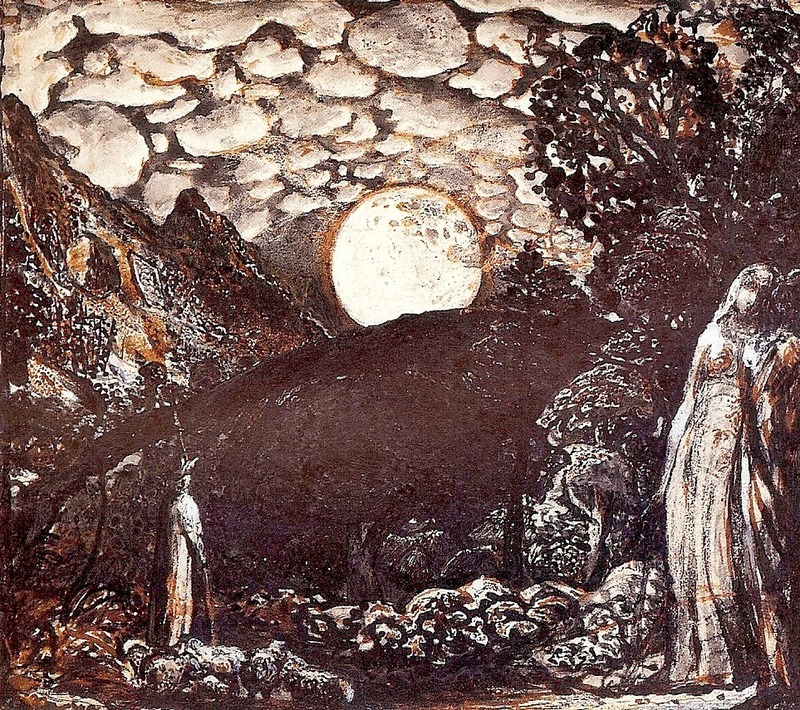 Whilst I was an Art Student at Bradford Regional College of Art we were shown a film about Samuel Palmer a British artist and mystic .The film was called The Magic Apple Tree , and it featured the piece of music Fantasia on a Theme by Thomas Tallis by Ralph Vaughn Williams. Sadly as far I can determine this film doesn't appear to be available to view online. I think the BFI British Film Institute has a copy but you can only view it on their premises if anyone knows of a copy viewable online please let me know!